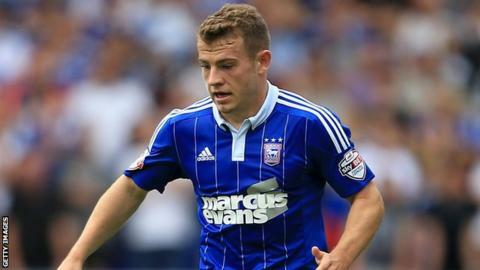 Ipswich midfielder Ryan Fraser scored a late equaliser against Bristol City which sent Steve Cotterill's side to the bottom of the Championship table. Fraser tapped home Freddie Sears' pinpoint cross four minutes from time. Ipswich captain Luke Chambers had put his side ahead just 45 seconds into the second half as he headed in Jonas Knudsen's cross at the far post. Bristol City then scored twice in three minutes through Luke Freeman and Jonathan Kodjia, but could not hold on. The draw leaves promoted City with just one win from their opening nine games, while Ipswich, who made 10 changes from Wednesday's 3-0 League Cup defeat at Manchester United, drop out of the early play-off places. Kodjia, who arrived at Ashton Gate from French side Angers in the summer, almost gave his side an early lead, but was denied by a fine one-handed save from Ipswich goalkeeper Dean Gerken. Ipswich's best moment of a first half of few clear cut chances saw Daryl Murphy's header brilliantly kept out by Frank Fielding. The game came to life almost instantly after the break as Chambers nodded home his first goal of the season before Murphy powered a shot just wide. However, the Tractor Boys found themselves behind before the hour mark as midfielder Freeman's weak effort took a wicked bounce off Tommy Smith, wrong-footing Gerken, and French striker Kodjia finished coolly after losing his man. Ipswich pressed forward in search of an equaliser and were rewarded when Bournemouth loanee Fraser scored his third league goal of the season from close range. Substitute Brett Pitman almost grabbed a winner for the hosts in stoppage time, but headed David McGoldrick's free-kick inches wide. Ipswich manager Mick McCarthy: "They started well and we needed a fantastic save from Dean Gerken to keep us in it, but I changed our shape and I thought we were the better team in the first half. "Their second goal was a good one from their point of view but defensively appalling. "But I must admire the response of my team for the way they got back in the game - and we had enough chances to win it." Bristol City manager Steve Cotterill: "I think we should have won the game so I am a little disappointed to be honest. "If you had said to me we would come to Ipswich and get a point, I would have taken that. But once we went 2-1 up, we stopped playing and stopped passing the ball. "There is a tinge of disappointment as we have ended up bottom in the Championship." Match ends, Ipswich Town 2, Bristol City 2. Second Half ends, Ipswich Town 2, Bristol City 2. Attempt missed. Ryan Fraser (Ipswich Town) right footed shot from the centre of the box misses to the right. Assisted by Brett Pitman with a headed pass. Corner, Bristol City. Conceded by Christophe Berra. Attempt missed. Christophe Berra (Ipswich Town) header from the centre of the box misses to the left. Assisted by David McGoldrick with a cross following a set piece situation. Offside, Bristol City. Nathan Baker tries a through ball, but Luke Freeman is caught offside. Corner, Bristol City. Conceded by Ryan Fraser. Substitution, Bristol City. Wes Burns replaces Jonathan Kodjia. Offside, Bristol City. Frank Fielding tries a through ball, but Aaron Wilbraham is caught offside. Attempt saved. Ryan Fraser (Ipswich Town) right footed shot from outside the box is saved in the centre of the goal. Assisted by Jonas Knudsen. Goal! Ipswich Town 2, Bristol City 2. Ryan Fraser (Ipswich Town) right footed shot from the centre of the box to the centre of the goal. Assisted by Freddie Sears. Cole Skuse (Ipswich Town) wins a free kick on the right wing. Corner, Bristol City. Conceded by Jonas Knudsen. Attempt blocked. Luke Freeman (Bristol City) right footed shot from outside the box is blocked. Assisted by Jonathan Kodjia. Substitution, Ipswich Town. Jonathan Parr replaces Luke Chambers because of an injury. Corner, Ipswich Town. Conceded by Nathan Baker. Attempt blocked. David McGoldrick (Ipswich Town) right footed shot from the right side of the box is blocked. Attempt blocked. Luke Freeman (Bristol City) left footed shot from outside the box is blocked. Assisted by Luke Ayling. Attempt missed. Joe Bryan (Bristol City) right footed shot from the left side of the box is high and wide to the right. Assisted by Derrick Williams. Substitution, Ipswich Town. Brett Pitman replaces Ainsley Maitland-Niles. Corner, Ipswich Town. Conceded by Derrick Williams. Offside, Bristol City. Aaron Wilbraham tries a through ball, but Jonathan Kodjia is caught offside. Substitution, Ipswich Town. David McGoldrick replaces Daryl Murphy. Offside, Bristol City. Jonathan Kodjia tries a through ball, but Aaron Wilbraham is caught offside. Attempt missed. Christophe Berra (Ipswich Town) header from the centre of the box misses to the left. Assisted by Ryan Fraser with a cross following a corner. Attempt blocked. Ainsley Maitland-Niles (Ipswich Town) left footed shot from outside the box is blocked. Corner, Ipswich Town. Conceded by Frank Fielding.